Guest Post: Thinking About Scrivener? You’ve probably heard about Scrivener, and if you’re wondering if you have time to learn how to use it or whether it’s as great as everyone says it is, take half an hour and try it. Scrivener allows you to organize your drafts, using tools effective writers have been doing for ages, but all in one place. You don’t need to use all that Scrivener has to offer, and it can still transform your writing process. • On the main screen there’s a binder on the left hand side that allows you to add folders, chapters, and research. You can import websites, images, and research there, too. • You can split your page horizontally or vertically to see two versions of the same piece at once. Or you can use it the split the view to two different parts of your manuscript, or a chapter and a website at the same time, or…you get the idea. You can also view your manuscript as a single page. • There’s a synopsis tab you can view on the right hand side that allows you to jot down the purpose of the chapter and keep notes you can utilize in the chapter. I like to view this tab at the same time I’m working on a chapter to remind me how to focus my writing, to keep me from going on tangents. • By changing the view mode, you can look at your chapters on a virtual cork board where you can rearrange the note cards that represent your chapters, just as you would on an actual cork board. But, when you’re done, the program has already rearranged the corresponding chapters in your binder. This is an example of what your screen looks like on Scrivener. Image taken from Literature and Latte’s website. Scrivener isn’t magical—it won’t write your book for you, but it can certainly help you turn that first draft into a brilliant one. And once you’re ready to send off your manuscript to a critique partner, editor, or friend, there’s a compile button. You check which sections of your manuscript you want to include, and then you can print, save, or export it in various formats, such as Word, PDF, ebook, and Web Page. I am still learning all the great tools Scrivener has available, but within an hour of downloading it, I got the basics. If you’re worried that it will take a long time to learn a new program, don’t be. Literature and Latte, the company that developed Scrivener, provides tutorials to get you started. In this ten-minute video, Keith Blount, the original designer of Scrivener, demonstrates how to do all of what I mentioned and more. If you need more help getting started, Literature and Latte offers several video tutorials, and there are a number of blogs out there devoted to the subject. Children’s and YA author Dee Romito also has a great, step-by-step overview to set up your first project at I Write for Apples. And, of course, there are books and Scrivener coaches out there as well if you want to really get into it. But, even with a minimal understanding, Scrivener can help manage your big projects and keep you organized. I use Scrivener for my adult non-fiction and for my picture books (it’s great to see the double-page spread and visualize page turns), but there are templates for all different forms of writing. If you want to test out Scrivener on your computer, Literature and Latte offers a free 30 day trial. The best part is that the days don’t even have to be consecutive—if you use it one day, and then again a month later, you have only used two days! If you’re wondering, I bought the program after the first day, and it’s been well worth the money, at least in my book. Right now, Scrivener costs $45, and for the month of November the company is offering discounts for those participating in NaNoWriMo. Either way, to get the software, go to Literature and Latte and download it. It’s worth it. If you need more help getting started, Literature and Latte offers several video tutorials, and there are a number of blogs out there devoted to the subject. Children’s and YA author Dee Romito also has a great, step-by-step overview to set up your first project at I Write for Apples. Pamela Brunskill began her career as an educator. She taught 3rd and 6th graders in Clarence, NY, focusing mainly on Language Arts and social studies. Now she is a mother of three and an instructor at the college level where she teaches education majors how to teach Language Arts. Over the last ten years, she began focusing more on her family and her writing. She has been published in Highlights for Children, and she writes picture books and adult nonfiction. She also helps authors create educational resources for their books at Authors and Educators. You can follow Pamela at her website, http://www.authorsandeducators.com, or find her on Twitter under the handle @PamBrunskill. Thank you Pamela for writing this up for everyone to read. I started the 30 day trial after talking to you about the software at Craft Day. There are a couple of other posts on my blog with updates and a tutorial video on how to use the template too. Claire, I love your template! Thanks for sharing. 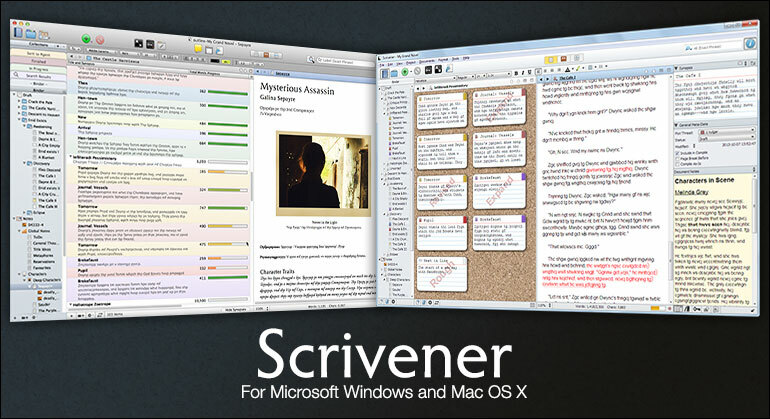 There are a lot of blogs that talk about my favorite writing tool, Scrivener. This is a super good example of one. So glad you liked it. And thanks for reblogging it! What a surprise to see you here, Pam! Great post on Scrivener! I’ve watched some tutorials previously but haven’t purchased it yet. I just purchased Scrivener. Did the tutorial just before Nano and am using it in the simplest form. I really really like what it does so far and am trying to incorporate features as I learn them. Probably will never use all its cool stuff but it’s there if I need it.